Chrissy's Belli Challlenge #15 - PENCILS! This Weeks Belli Challenge is PENCILS Your challenge this week is to make a project using any kind of PENCIL! Art Pencils with Gamsol, Watercolor Pencils, Metallic Pencils...let your imagination go wild! I bought a box of Prismacolor pencils and have let them sit. I also have a box of watercolor pencils, I rarely use! 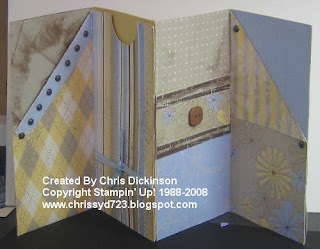 Make a completed project and share the link here in the comments linking to my Blog and CBC15. 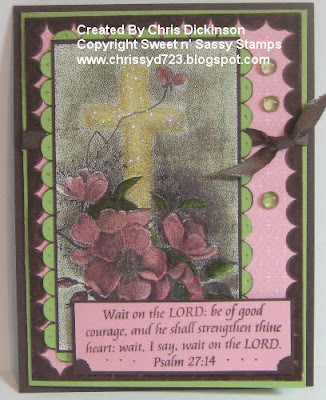 When you post to Splitcoaststampers or to your Blog, be sure and put CBC15 as the KEYWORD and mention of the challenge! 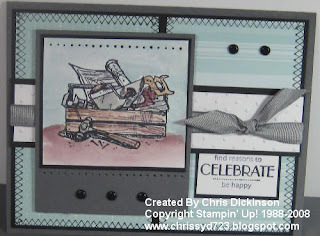 The winner will recieve a memo cube, stamped or unstamped. Deadline to make a comment with the upload and do the Challenge will be on Monday evening. A random drawing will be held on Tuesday and the winner will be announced on Wednesdays! This week's winner is Joan Ervin. I will attach her link soon, right now my computer is acting fussy. 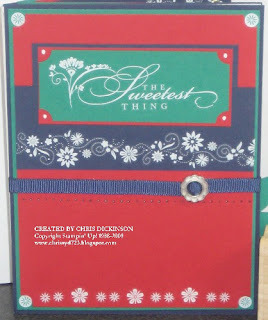 Between doctors appointments, getting side tracked with other stamping projects and being out of town, I did not get a project completed yet...just started! Once I get my children started on school this morning, I will complete my project and have one here for you. Sorry for the delay! 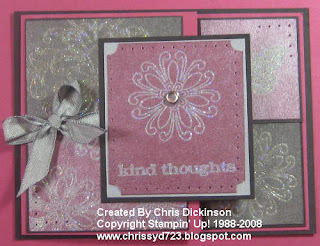 My card also utilizes the Splitcoast Sketch Challenge #174 and the Penciled twinks technique. Oh yes, one more challenge! 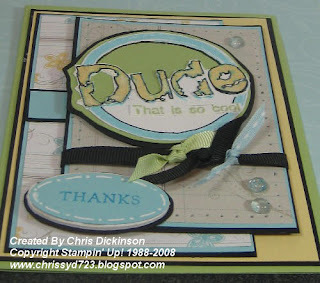 Korin's Fantastic Friday Challenge was to make a Masculine card! Guest Designer? Your name could be here! :) Contact me if you are interested at chrissyd723@gmail.com. 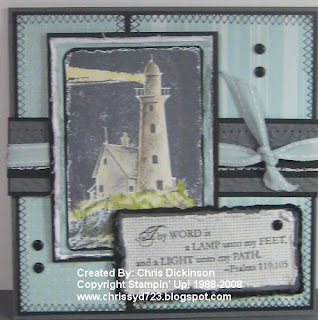 Todays Splitcoast Color Challenge is Purely Pomegranite, Soft Sky and Basic Black - Liz Miller's birthday was on Sunday and I am LATE in sending her a card and her gift for the Belli Challenge. Sorry Liz, I hope your birthday was FABULOUS! 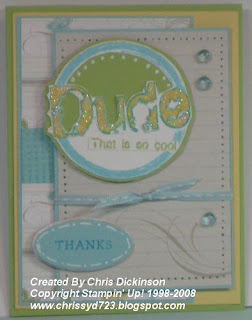 DUDE! With or without Black? 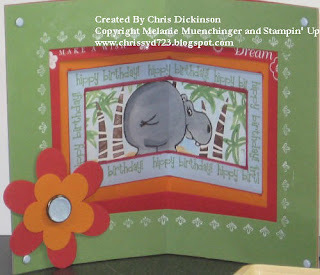 Today is Debby M's Sketch challenge and at first I made this card. I decided it was to BLAH - and did not POP out at me enough. So I let it sit for the day. After looking at it for a full day, I decided I just could not stand it and took it all apart. Do you ever do that? Well, I did that today, while my kids were doing some school work... I only added a "FEW" layers of black and then outlined the letters of DUDE with a black marker instead of the turquoise. What do you think? With Black or without? Here is the link for the instructions, generously shared by Beth Warner. This is what I came up with. Today is our friend Doug's birthday and he loves to play golf on the Wii and game cube. I just bought this stamp to make a birthday card for him. 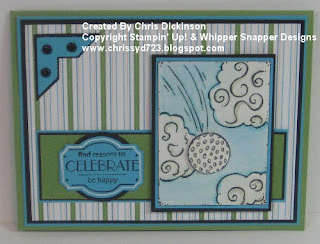 It is called High Ball by Whipper Snapper Designs. Thank you for looking! Have a fabulous weekend! My new friend from Alaska, Nancy Grant sent me this adorable card. 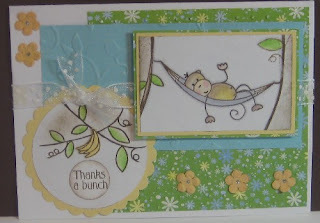 I just love this paper and think these monkeys are adorable! Isn't it cute? Shelly Schmidt was SO very generous! She sent me a bunch of Cuddlebugged Waxed images so I can do the Technique Junkies Technique - Waxy Cuddlebug - I still have to work on that! 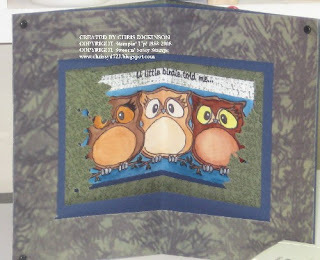 But this is one of her beautiful creations using that Technique. 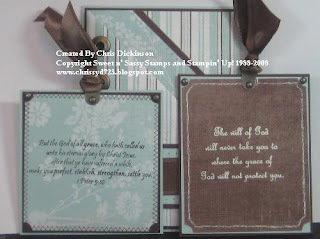 I have been blessed the past few weeks with many RAK's - This RAK was a Just One swap with Deb Lovett. 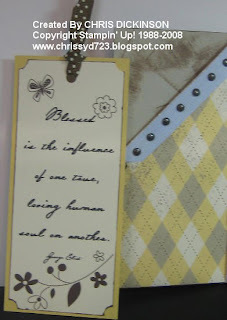 I am mailing her card out next Tuesday, if I do not get it out tomorrow. 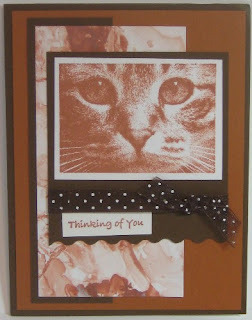 I love this cat stamp! Very cute! Oh! 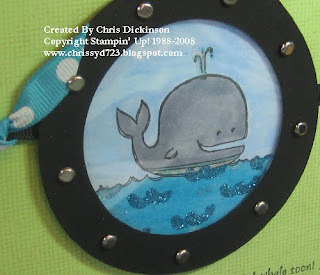 I just noticed Korin at Inky Doodle is having her Friday Challenge too and it was to use 3 different embellishments - so this is going towards her challenge too! Thanks for the inspiration Korin! Thank you for looking! Have a blessed evening! Chrissy'd Belli Challenge #14 - RIBBON! So come join us in the Belli Challenge and be sure to post your link to the card! 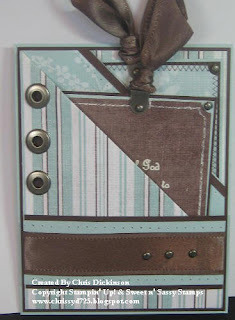 This Weeks Belli Challenge is RIBBONS! 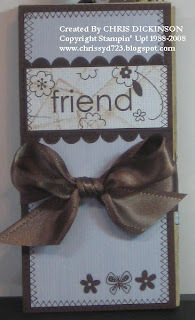 Your challenge this week is to make a project using RIBBON without tying a bow or a knot. 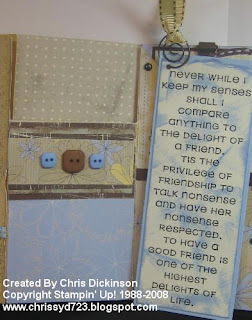 Make a completed project and share the link here in the comments linking to my Blog and CBC14. 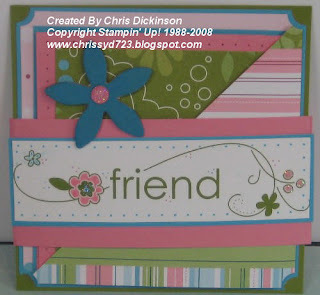 When you post to Splitcoaststampers or to your Blog, be sure and put CBC14 as the KEYWORD and mention of the challenge! The winner will recieve a memo cube, stamped or unstamped. 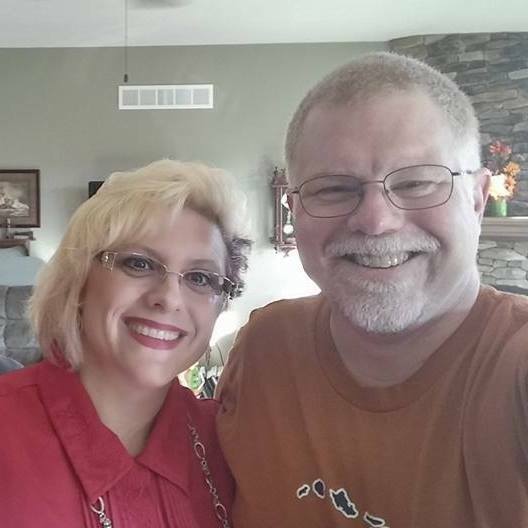 This week's winner is Liz Miller. Click on her name to see her awesome gallery! The sketch I used was also a challenge from Debby M.
You know what? I think I am the worst procrastinator when it comes to mailing things. I have been wanting to mail a card to a friend for about 3 or 4 weeks and I have not done so yet. I have kept her in my prayers now for several weeks and every day when I pray for her, I think I should be sending her a card. I praise God that He does not need to wait to respond to my prayers - that I can pray through out the day for my friends and He hears them immediately not waiting to recieve a card from me! 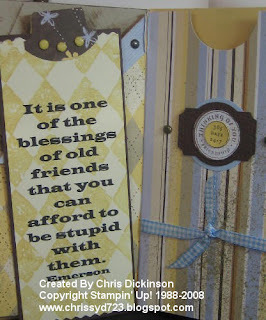 :) So for my friends- know that I pray for you often and I am just "SLOW" on sending out a note letting you know. 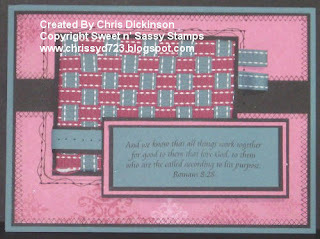 2008-2009 NEW IN COLORS by Stampin' Up! I can NOT wait to get these in my hands. I LOVE them! Aren't they so FABULOUS? As demonstrators, we will be able to pre-order them in July. 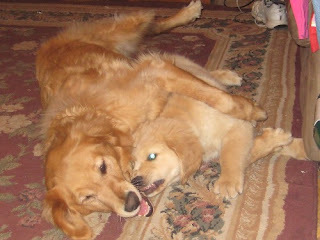 I can't wait to get them and play. This is Beate's WSC44 - and the creation I made with it! 3. 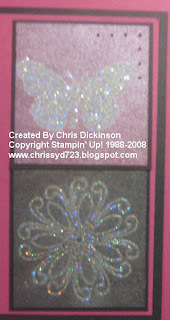 Wipe off image with a kleenex and get excess ink off the embossed image. 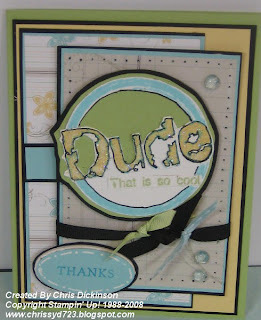 I changed the colors AND the stamps AND the Pretties Kit. 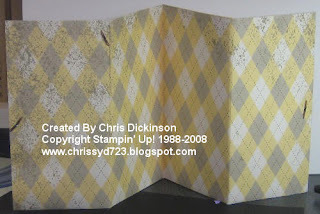 I also added some holes to the scalloped portion along the bottom. 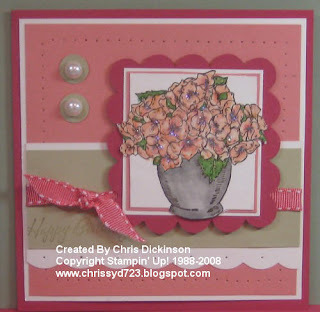 My hubby will give his mom this card for her birthday. 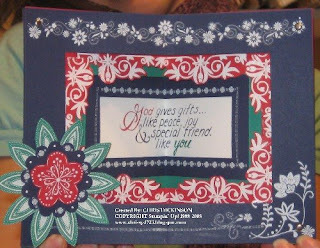 Accessories: Cricut - Mini Monograms, corner rounder, Paper piercing Tool, Mat Pack, Dimensionals, Pretties kit, half inch circle punch, Mini glue dots. 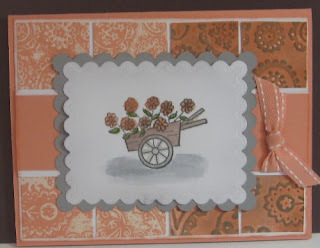 Here is another card I made for the Sketch Challenge this week. 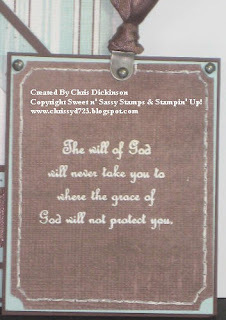 I will be sending this to a dear friend, who I saw this week and is need of some extra encouragement. Thank you for looking! Have a nice weekend - I will be getting together with some friends! I will post some pictures on Sunday and next week. We will be participating in a Shoe Box Swap! 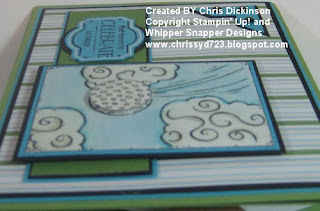 Today is Sketch Challege day on Splitcoast Stampers! You can see the details here. I also used the color challenge 159 - those colors were Basic Gray, Soft Sky and Whisper White - I added Black too. I used the cuddle bugged images from my friend Joan. Chrissy's Belli Challenge #13 - UFO's Un-Finished Objects! This Weeks Belli Challenge is UFO's - Un-Finished Objects! Come on, you KNOW they are there... unless you are NOT like me. 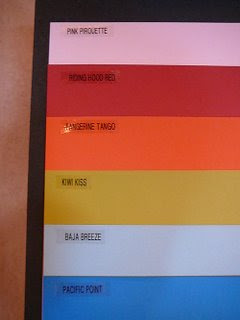 LOL I have about 4 of them, but this Tag Book has been haunting me for about a year. I kept looking at it and FINALLY with THIS challenge I completed it. Your challenge this week is to complete at least one UNFINISHED projects in your office. 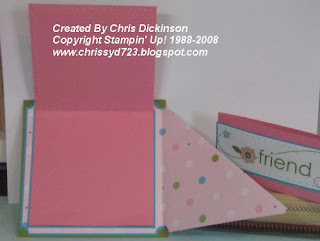 And if you are NOT like me and have all of your projects completed - Your challenge is to make a Tag book! :) It does not have to be as involved as mine. 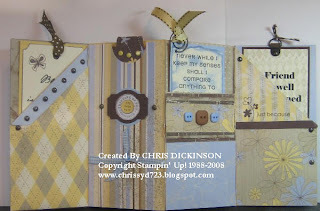 Make a completed project and share the link here in the comments linking to my Blog and CBC13. 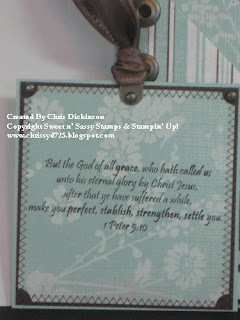 When you post to Splitcoaststampers or to your Blog, be sure and put CBC13 as the KEYWORD and mention of the challenge! 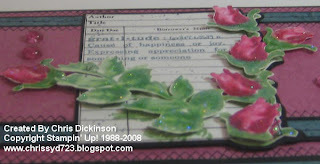 The winner will recieve a handmade personalized journal in a similar style as the tutorial I wrote last week. Todays Technique Lover's Challenge on Splitcoast is a Double Pocket Card! You can find directions here at Judy's website - Thank you Judy! Accessories: Coluzzle, Silver Brads, Dimensionals, Black grosgrain, Turqouise polka dot grosgrain (brand unknown), Ticket corner punch, Paper piercing Tool, Mat Pack, 1/16th hole punch. I started this today and will finish the outside tomorrow or Monday. We are having company over tomorrow, so it will depend on how much time I get to stamp. But for this evening, I am calling it quits. I am tired! 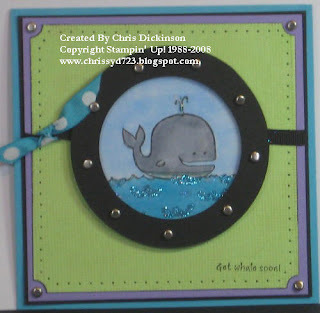 Accessories: Fiskars cutter, Build a Brad, half inch circle punch. Eastern Elegance Rub Ons. 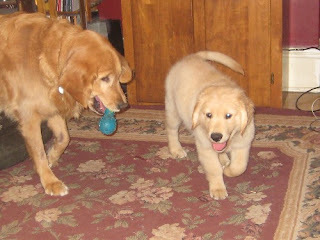 When we first bought Rusty, who is 5 years old, a few years ago, he came from a wonderful home with 2 other dogs. He liked it here but was a bit lonely and would always enjoy going to my sisters' house with her 3 dogs. He loved his Doggy friends! It has been a few weeks since I have taken the time on the weekend to do Beate's Weekend Sketch Challenges, so I will have play catch up now! 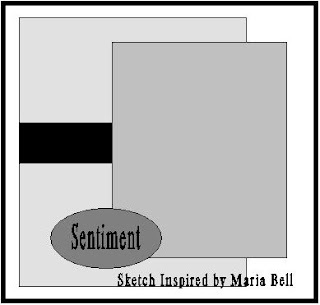 This is her sketch challenge this week. those pieces into my scrap box. After making the Kaliedascope card last night, I loved that technique so much I had to make another! 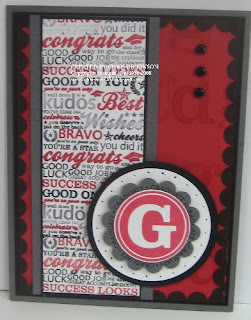 BUT this time, I used Splitcoast Stampers Color Combo 161, which was Real Red, Glorious Green and Night of Navy. I recieved the instructions from the Technique Junkies Newsletter in the April-May 2008 Newsletter, it was the online bonus! Kaliedascope Here's Hootin' For Shelly! A new friend and I are going to swap Technique cards! 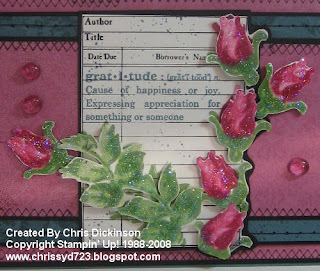 Shelly made some beautiful cards for Technique Junkies, so I asked to "see" it in real life and offered to make something for her out of the Technique Junkies Newsletter. 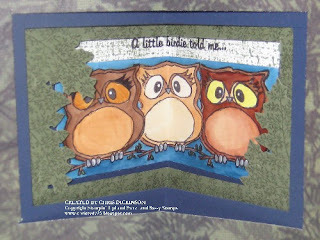 The technique I did was the Kaliedascope Card from the April-May Online Bonus Technique....For directions please check out the Technique Junkies Newsletter! 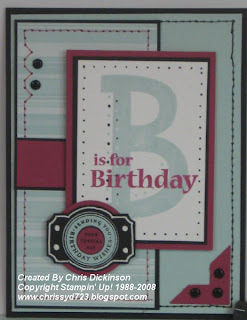 I am not sure if you can tell but this layered and stacked with lots of dimension! This was a FUN technique! 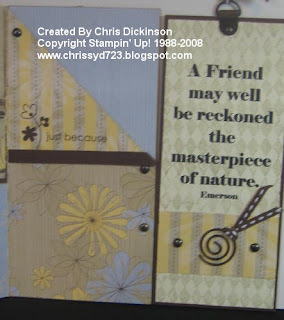 Stamp Sets: Touched By Nature and Rough Around the Edges by Stampin' Up! 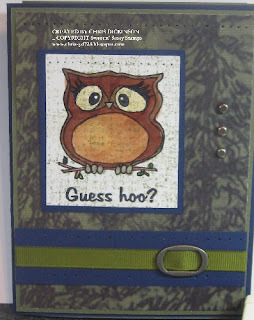 and Owl Occasions by Sweet n' Sassy Stamps. Another Belli Challenge #12 Guessss Hooooooo?